Welcome to the Himalayan Education Lifeline Programme, or HELP for short. We are a limited company registered as a charity (No. 1117646) with the Charity Commission of England and Wales. We are all volunteers, including the directors, so the money we receive goes towards our charitable activities, not salaries. What motivates us? Call it ‘passion’ if you like, a word used so glibly and meaninglessly by the corporate world. We know and love the Himalayas and the people who live there, and want to do something to improve their lives. It’s as simple as that. Many Himalayan families are trapped in a cycle of poverty. Living at subsistence level, parents need the labour of their children, particularly the girls, to help the family feed itself. This means that they cannot always afford to release their children to attend school or college. Even if the child can go to school, the quality of education is often very poor. Problems include untrained and unmotivated teachers, unaffordable books and uniforms, crowded classrooms (and often different class levels have to share the same classroom). Of those children that do manage, against the odds, to get through their schooling, very few indeed are able to go on to higher education. The consequence of this is that many of these children do not get the education they need to achieve their full earning or social potential and so remain trapped in the impoverished existence they are born into. The aim of HELP is to help selected village schools raise the standards of education that they can provide to the children of their communities, and to give the poorest children a chance to go to school and college.In so doing, we hope in the longer term to have an impact not only on their own living standards, but also on those of their extended families and of the wider communities they come from. 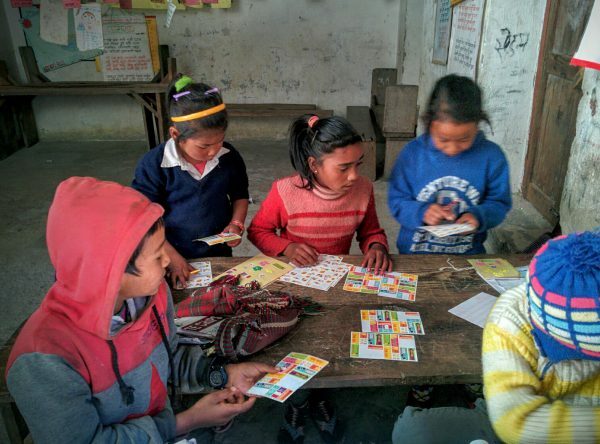 Students in Nepal in an unheated classroom. sponsor young people with the potential to benefit from a school or college education, but without the means to do so.